'Maha' means 'great', 'mighty' or 'strong' in Sanskrit. Maha Motion works with the power of movement. 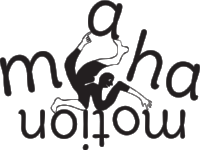 Maha Motion works with children, adolescents and adults and offers individual, relationship as well as family therapy. You can choose DMT when you think a more bodily approach would suit you. DMT can be helpful in a lot of different cases. Please don't hesitate to get in touch to ask your questions or book an intake. Maha Motion offers coaching in a different way, for those moments when you feel a change is needed, but 'therapy' is just too big of a word. Of when you're in a process of personal growth and could use a new approach for the challenges you're facing. In Body Oriented Coaching the bodily experiences are an important part of the work. Because your personality traits can be given away by the way you move, even scientists say! This means that our body and your personality are correlated. With Body Oriented Coaching, Maha Motion offers you a no-nonsense and out-of-the-box way to improve your self-awareness and feel more powerful towards challenges in your life. Your coach will be using different kinds of coaching techniques such as drama triangle, core quadrants and and voice dialogue. But in Body Oriented Coaching, above all, you learn to listen to your body's signals and build a bridge between head and body. Creative work and writing can be part of the coaching sessions as well as different physical practices to help you on your path in a experiential way. Learning through action and finding solutions for problems with much more then just your thoughts. Focusing, breathing- and relaxation techniques, family constellations and even yoga can be part of your coaching sessions. Coaching is a very personal matter, so the process, frequency and goals will look differently for each and everyone. In the intake session we will determine the frequency that best suits you and your situation. The first sessions will clarify your goals and together we will work to let you accomplish them in a way that fits you, or sometimes invites you to step out of your comfort zone. We will be working in your own home or somewhere outside. Please get in touch if you're interested or have any questions. In 2014 over 14% of Dutch employees reported complaints related to burnout. And even 53% of American workers report feeling burned out at work. More and more research proves that dance/movement therapy (DMT) is effective. It has a positive effect on the mood, improves quality of life and self-confidence and decreases depression and fear. This makes this therapy a great choice in preventing burnout in the workplace and treating employees who are suffering from it. Off course, DMT can also be offered at work when employees are facing challenges such as Asperger Syndrome or chronic fatigue. Working in a team can be quite the challenge. Within strong teams trust and tolerance are shared values and teams even have their own 'team-identity'. But working under high pressure, communication difficulties, incomprehension or a lack of agreements or goals can cause friction. Mama Motion offers a unique and refreshing way for employees to help build en develop their teams. By using dance/movement therapeutic techniques, the core of a problem will soon become visible. In creative and playful ways mutual solutions will be found. Your team will grow together to take their collaboration to a higher level, not just by talking and (over-)analyzing, but particularly by experiencing in action and movement. Because experiences have much better endurance then thoughts! You will get useful tools to make turn team meetings into surprisingly efficient and stimulating gatherings. Every team member will feel more empowered.